There are 437,000 agents in California, enough to form the state's eighth-largest city. With only 680,000 home sales a year, competition for listings can be savage. Let's think about that for a minute. Using those numbers, each agent gets 1.5 sales per YEAR! Of course, the median home price is somewhere around $500,000 in California, so each agent would make somewhere around $30,000 per sale (that's at 6% commission with no splits!). At 1.5 sales per year, each agent makes $45,000! Granted, my numbers aren't precise. I also haven't taken into account the fact that the agent must split with the firm they work for. Anyway, there's definitely some bubble action going on in California. Terry Savage's "The Savage Number"
I read Terry Savage's "The Savage Truth on Money" several years ago. I was just on her website, TerrySavage.com and noticed that she has a new book coming out the middle part of June. The book will be called "The Savage Number," which is going to address retirement savings and how much is enough to live comfortably on. With the oldest Baby Boomers turning 59 this year, the book release is timely. Obviously, since the book isn't out yet, I haven't read it, so I don't know whether or not it is any good. But, I can tell you this: if it is as good as her last book, it will be worth it. I have written a couple of posts on interest-only mortgages ( you can check them out here and here). There's also a couple of good articles on the MSN Money site. Tip: Ask yourself whether you are disciplined enough to make the payment to principal when you aren't obligated to. Tip: On some IOs, the payment doesn't adjust for a year, and on others it doesn't adjust until the end of the interest-only period. ASK! Tip: Ask yourself whether you are comfortable with the risk that the expected higher income won't materialize. If you don't need an interest-only mortgage to qualify for the house you want to buy, it is not the best choice. If you’re a disciplined investor, good with money, a bit of a risk-taker and not buying more house than you can handle, an interest-only mortgage could work for you. If you’re not all of those things, you probably want to stick to a more plain-vanilla mortgage. I think this is very wise advice. I was over checking out Ben's Housing Bubble blog and found a link to an article on the Dallas News website about the Housing Bubble. I think we are currently in a housing bubble. Some areas are worse off than others. I think, like all bubbles, this bubble will burst. How severe it might be, I have no idea. All I know is that if you are highly leveraged in real estate that loses value, it's not good! I'm aware that a significant number of my readers are bloggers. This post is for them. Of course, everyone else is welcome to read this post! Anyway, when I was working on a post last week about online to-do lists, I came across a pretty cool blog called To-Done. I thought this post on the To-Done blog was very practical and could be useful to all the personal finance bloggers out there. I found his most useful because I am very busy building a financial planning practice, building readership of AllThingsFinancial, and I also have a wife and kids. I'm very busy. I'm also very unorganized, which isn't good! I found his article most helpful. Maybe you will too. Use this checklist to gather infromation. Give a copy of the list and the relevant documents to whoever will be handling your affairs. Funeral instrustions. Do you with cremation, memorial service, and/or funural with open or closed casket? Special information in death notice in newspaper. Papers to contact. Important notes: There should be only one signed copy of a will. If you change law firms, have the original attorney send the will to his or her successor. But your health care agent should have a signed copy of the health care proxy and living will. A safe deposit box is sealed when the bank learns of the owner's death, so the will - and any other papers that may be needed immediately after death - should be left elsewhere. Spouses with separate boxes should not keep each other's wills in them in the event of death in a common accident. So, if you ever sell your house, be sure your agent doesn't try to use those terms. Instead, use terms that are descriptive and not vague. I hope everyone has a nice Memorial Day. My family and I are just going to hang around the house today. We have no plans, which is nice. It seems like we have been so busy. Today would be a great day to read this post. I might post again today. If not, I'll get back to AllThingsFinancial tomorrow. Have a good day! About six years ago we took the kids to this Halloween Carnival. I was running low on gas but thought: "ah, I can make it. Then I'll get gas on the way home." Well, of course on the way to the gas station we run out of gas. We were about a mile from home and had a 4 year old and a 2.5 year old sitting in the back seat. My wife wasn't too happy either! So, I came up with a plan. I had a 5 gallon gas can at home. I would run home grab the gas can, hop in the Honda and come back and fill the car up. So, I told my wife and off I went. Running in the dark all the way home. I get home go in the house to get the Honda keys but they are NO FREAKIN' WHERE TO BE FOUND! I couln't find them anywhere. Well, this really ticks me off! I'm wondering how the heck I'm going to get a 5 gallon container of gas to our car. They are pretty darn heavy - too heavy to lug a mile. So, I figured out that I would strap it into the Baby Jogger stroller that we had and run back to the car. That's what I did. I got all the way back to the car huffing, puffing, and of course, cussing. I fill the car up and get back in. My wife is sitting there very quiet. I tell her that I couldn't find the bleeping keys and asked her if she had them. Of course she had them in her purse! The funny thing was: I ASKED her before I left to go get the gas if she had the keys and she said no without looking in her purse! But, it was really my fault for letting the car get so low on gas! Anyway, it is a funny story now, nearly six year later. Yesterday I posted a short bit comparing the taxes of two different families (Married filing jointly). Today I'll show you how the taxes are computed. It is really simple as long as you know what the different brackets are. Also, it helps to have excel so that you can program it to compute them for you. Now I'll show you how to calculate the taxes due for a family. For this exercise, we will assume that this household has a taxable income of $60,000 and they are going to file "married filing jointly." We will calculate the tax for the 2005 year. Looking at the bracket chart you can see that the first $14,600 of the $60,000 will be taxed at 10%, which is $1,460. The next $44,800 ($59,400 - $14,600) will be taxed at the 15% rate which comes to $6,720. The remaining $600 will be taxed at the 25% rate for a tax of $150. Adding them together, we get a total tax bill of $8,330 ($1,460 + $6,720 + $150 = $8,330). So, there you have it. Hopefully I made it easy enough to understand. The hardest part is getting to the taxable income figure. Maybe I'll cover that someday. The column on the left is the year. Notice there is no 1999 information because I couldn't find the info. The second and third columns are the amount of taxes that each income category would have paid. The family with the $500,000 in taxable income saw their taxes drop 13% from 1998 to 2005, while the family with the $60,000 in taxable income saw their taxes drop 26%. It would be interesting to see how the cut in dividend taxes affected taxes. If anyone knows where to find information on who owns the dividend-paying stocks, please let me know. This is off topic, but I follow several blogs' traffic through their SiteMeter accounts. I was on the LifeHacker blog and clicked on their SiteMeter. HOLY COW! They already have nearly 12,000 hits TODAY and over 1,600 in the last hour! Here I am sitting at about 70 for the ENTIRE day! Makes me kinda sad. I changed the color of all the links to blue. Do you like it or hate it? Should I change it back to the brown color it was before? Weigh in by using my handy dandy poll located to the left (It's not the most professional poll, but it is Friday so let's have fun!). Ben over at TheHousingBubble blog is having problems with his account. So, he has set up a second blog called TheHousingBubble2 that you can use until he gets his problem resolved. One of my weaknesses comes in the organization category. I'm just not organized. Never have been, but I refuse to believe that I always will be. So, when I saw a column in the Wall Street Journal a couple of days ago talking about Online To-Do lists, I took notice. The advantage (or disadvantage depending on how you look at it) of online to-do lists is that other people can look at them. This is cool if you collaborate with someone from a distance. But, it could also mean that things are public that you want private. Anyway, here's the list of providers. Some charge fees others are free. BackPackIt - has both free accounts and paid accounts starting at $5 per month. For businesses, they also offer BaseCamp. Ta-da List - a free no-frills list. Use Tasks - Charges $3.95 per month. 43 Folders - a blog for fans of David Allen's book "Getting Things Done." To-Done! - Also for fans of David Allen. Those will get you started. NOW GO GET ORGANIZED! On the front page of the Personal Journal section in today's Wall Street Journal, there is an article that everyone should read regarding how lenders are starting to crack down on inflated real estate appraisals. According to the article ($), accurate appraisals are difficult to perform in hot housing markets because prices are so volatile. However, in some cases, the appraisals are outright fraud. The FBI has noticed an increase in cases where the appraiser and the borrowers team up and the appraiser provides a misleading valuation. This is unfortunate because appraisals are supposed to protect both the lender and the borrower from overextending themselves. To be fair, appraisers say that they are often pressured to increase valuations by mortgage brokers, loan officers and real estate agents, all of which have a lot to gain from a "good" appraisal. Anyway, this is a great article. Check it out. The numbers on the right indicate the amount of the split (2.0 means it is a 2 for 1 split). Here's a link to the actual press release. I have always liked reading James Stewart's books and articles. Currently, he writes the Common Sense column in Smart Money magazine, which is also published in the Wall Street Journal every Wednesday. Today's column was a pretty good one regarding real estate. Here's a link to a column that is similar to the one in today's WSJ. "Even if prices go down, you will still own an asset. If you enjoy living in it and can meet the monthly payments, what difference does the market value make?" Personally, I think that is a rational approach. Anyway, read the rest of the article. I think you'll agree with me that he makes a lot of common sense! I saw this in the WSJ and thought I'd pass it along. There's a new "semiactive" exchange-traded fund on its way. It will be called Q Funds Technology Focus Portfolio Exchange-Traded Fund and will be managed by Firsthand Capital Management. The fund will be use a quantitative formula to find 30 technology companies out the S&P 500 Index that are poised for growth. Each stock chosen would have an equal weighting in the portfolio. According to a study released by the Spectrem Group, there are now 7.5 million households in the U. S. with a net worth of at least $1,000,000, which is a 21% increase over 2003. I'm not too familiar with surveying techniques, but I don't understand how they can come up with that number by surveying 450 qualified respondents. Households worth $3 million or more earned 34% of their money from investment gains. The affluent held 9% of their assets in cash. 30% of the affluent make most of their financial decisions without the help of a professional. 10% let their advisors make all the decisions. The number of households with a net worth of at lest $5 million rose 38% last year to 740,000, up from 480,000 in 2001. Millionaire households controlled $11 trillion in assets in 2004, up 8% from 2003. Interesting stuff. I can't wait to join the ranks. So far, we are about 20% of the way there. Tags: Becoming a Millionaire, Millionaire Households in the U.S. This is way off topic, but I wanted to share it with my readers. This was in yesterday's Wall Street Journal. This is a keeper. It has nothing to do with personal finance but I wanted to share it anyway. I was born in Wisconsin. We lived in a town called Webster, on a road called Lavern Lane. Since then many things have changed, but many more remain the same. We no longer live in the country, we only go to church once or twice a year, and we no longer struggle to make ends meet. Today we live in the city, but we still have a JunkYard, my dad still works 16 hours a day, everyday. Today I am a man not a seven-year-old child. There are still cars everywhere. We own over 90. About 20 of them still run and 12 of those we store in the city. No we don't have a parking lot. What we do is borrow our neighbors unused stalls for fixing their cars and doing other little things for them. I admire my Father more than any other person on this planet, not for being a mechanic, not for being a tough guy. I admire my father for his ambition. For 30 years he has gone to work everyday, for 30 years he has come home, gone to the garage and worked 10 more hours. I don't know how he does it but I do know why. He does it for us. He wants my brother and me to have everything we need and most of what we want. Lots of people say that the best way to learn is by the example of others. Well, then I have one of the best teachers there is on how to be a man, how to treat others, and the work ethic. I mean he is not perfect by any means but is anyone really perfect! I think that he is pretty close. Sometimes I wonder if my dad ever thought of college. I wonder if he's happy. I sometimes even feel sorry for him. What I mean by that is that I look at him and see a guy that has spent his entire life working. That is what he does. He works. If my mom never brought up the idea of a vacation he would never think twice. He would work to the day he died. I love hard work, but how do you go to the same dead end job everyday knowing that you will be doing it forever. Every now and then someone that had my dad fix their car will stop by and need something, and every time I talk to them they start talking about my dad's work. They compliment him on paint jobs he did 20 years ago that still look like they are brand new. That reminds me of another trait I have taken from my dad besides my hard work ethic. "If you are going to do a job, do it right the first time, because a job not done well is a job not worth doing," so the saying goes. I take that personally. If someone has an honest complaint about my workmanship, I will bend over backwards to make it right. If people are going to pay you good money to do something then you had better do a darn good job. That is why I usually work alone, then, if there is a problem I know whom I can blame. My dad hasn't taught me everything though, a lot of it I have learned on my own too. I still got a lot to learn still, but I have figured out things like how to deal with people you don't like or those that don't like you. I also learned why when cutting a frozen bagel you cut away from yourself, I got the scar to prove it. My dad calls this type of learning "the school of hard knocks." Some of the knocks are harder than others. I love sports. I love football, wrestling, weight lifting, skiing and hockey. I love the thrill of competition, the roar of the crowds, the agony on the faces of your opponents as the final seconds tick off the clock. However, I don't want to do it as a profession. I think it would be fun for a while then it would get boring. I guess the point that I am trying to make is that when I am on my deathbed what am I going to look back on? Will it be 30 years of playing a game that in reality means nothing, or will it be 30 years of fighting crime and protecting the country from all enemies, foreign and domestic. I want my life to account for something more than just a game. In life there are no winners, everyone eventually loses their life. I only have so much time; I can't waste it with a game. I don't want those close to me to look at me and tell me that I was good at a game. I want to be good at life; I want to be known as the best of the best at my job. I want people to need me, to count on me. I am never late; I am either on time or early. I want to help people. I want to fight for something, be part of something that is greater than myself. I want to be a soldier or something of that caliber, maybe a cop or a secret service agent. I guess what I want most of all is to be a part of the real world, not an entertainer. I want to have an essential role in the big picture. I want adventure, challenge, danger, and most of all I don't want to be behind a counter or desk. Maybe when I am a 100 years old I will slow down and relax. Till then, I have better things to do. There are 281 houses in our part of town. We made a map and I drew the boundaries as to how far they could go to look for business. Since we live in the middle of a decent sized town, I didn't want them running all over the place. Also, by knowing how many houses are their "target market" they can control printing costs for their brochures. Today, I'll help them get their brochures made. We'll probably use Microsoft Publisher 2003 and I'll add a picture of the boys with their dog. Oh yeah, this has the makings of a bubble written all over it. Today's front page of the Wall Street Journal had a story about how people are taking any equity that has built up in their homes and buying "investment" real estate. As more and more real estate becomes "investment" properties, it causes a glut in rental units. We all know how supply and demand works. As the supply of rentals increases, the rent for each unit goes down, making it more difficult for landlords - investors - to make a profit. "For now, however, so many Americans are racking up such huge paper profits in real estate that herds of new investors are crowding into the market every day. Thanks to rising home values, they have lots of money to spend." The article goes on to say that according to Economy.com, Americans pulled out about $705 billion in equity from their homes last year compared to $266 billion in 1999. That's a huge increase that was probably fueled by the fact that the average home price rose 50% in the last 5 years. My boys decided that they want to start a housesitting service for this summer to help people who go on vacation. We mapped out the area that they can prospect for customers in. They are going to go count the number of houses so that they can print an accurate number of brochures. Then they'll work on their brochure - with my help. Anybody have any ideas as to how much they should charge? I'll keep you updated on their entrepreneurial endeavors. Maybe I should have them contact Neville for some tips? In my last post, I talked about what interest-only mortgages were and how they worked. This post will talk about the pros and cons of using them. If the interest rate is low enough, the money "saved" by going with an I/O could be invested somewhere else. But, this only works if the money is actually invested. My hunch is that most people are getting I/Os because that is the only way they can afford their house. Eventually they will have to start paying principal. Let's say you get an I/O for $120,000. You pay on it for 3 years and then have to move. What happens? Well, depending on the set up of your loan, you probably have not yet paid anything towards the principal. That means at the end of three years you still owe $120,000 - meaning, you don't have any equity. You won't have any money to put down on another house. And, if priced have declined, you could actually owe more money. This would not be a good situation. There are other things to consider when deciding on the type of mortgage you want. When looking at an I/O be sure you know everything about it. I have read about some I/Os that add principal to the mortgage - meaning the amount you owe grows over time. So be sure and read all the fine print. There are mortgage brokers out there who are less than honest. I have been hearing a lot of talk lately about interest-only (I/O) mortgages. These are mortgages that require the borrower to only pay interest (rather than interest and principal) the first few years of the mortgage, thereby reducing the payment amount. Is this a good idea? The interest portion on the first payment would be $600 - "saving" the borrower $119 per month. The payments would then decline with each subsequent payment. At the end of 5 years, you would pay a total of $34,832.87 in interest. At the end of 5 years, you would still owe $120,000 on the house, which would then have to be financed. But, instead of 30 years to finance the mortgage, you would have 25 years. So, your new payment would be $773.16 per month, $53.70 more than the orginal payment and $173.16 more than the I/O payment. Over the next 25 years, you would pay an additional $111,948.50 in interest for a total of $146,781.37 in interest over the entire period. Had you gone strictly with a standard 30-year fixed mortgage, you would have paid $139,006 in interest over the course of the loan or $7,775.37 less than the I/O mortgage. Those are the facts as I see them. With my next post, I'll go into more detail about the pros and cons of I/O mortgages. RealEstateSuccess. Her blog is written from a real estate agent's point of view. Interesting stuff with some good tips. Go check it out. I PROMISE no POPUPS! I am happy to announce the addition of a new real estate blog to my links. This blog takes a very different stance on real estate. The blog is called TheHousingBubble and it deals with why he thinks we are in a real estate bubble. Interesting stuff. If you aren't familiar with Junior Achievement, you might want to check them out. I don't know that much about the program but I fully intend on contacting my local branch and asking them some questions. One thing that bothers me about their program is that they don't seem to teach personal finance per se. But, I guess ANY financial education is better than NONE! This is an updated post from one I did a couple of weeks ago. Also, for those interested, here is a link to Bill Miller's 2005 1st Quarter Commentary. Pretty interesting stuff. I found this article by Eileen Ambrose on the Chicago Tribune website. College graduates who understand the rules of personal finance are way ahead in the game of life. If you are the parent, relative, or friend of a college graduate, make sure you have them read this article. 2. Enroll in your company's 401(K) plan or open a Roth IRA. Make this a PRIORITY! 3. Set 3-6 months worth of living expenses away in an emergency fund. Don't spend this money unless it is necessary. If you live within your means, life will be much, much more pleasant. You see them all the time: credit cards with 0% interest rates on balance transfers. One thing you have to look out for is that some of these cards come with strings attached. For instance, on some of these cards, you must make a certain number of monthly purchases (at much higher rates). Because of the way the cards are set up, the monthly purchases do not get paid off until the transferred balance is paid off. So, what you thought was a 0% interest rate is really much higher. Terri Cullen over at the Wall Street Journal has written a very good article on credit cards, which is worth reading. Be sure and scroll all the way down and look at the tables. FMF of the FreeMoneyFinance blog made a very good comment regarding my last post on payday loans. I asked the question as to whether or not these companies should be made illegal. Of course I don't think they should be illegal. I think that people should be responsible enough to NOT use them, therefore driving them out of business. It all boils down to education. People NEED to be educated about personal finance. That's all there is to it. The problem is, those people who need to be educated aren't hanging around the personal finance blogs. So, they must be reached some other way. I would like to open this up to discussion. Please post your comments as to what you think should be done to better educate people about personal finance. Payday Loans are a No-No! I'm not a big fan of 60 Minutes. However, tonight they did a segment on payday loan companies that I think everyone should have to watch. Here's my advice to ANYONE who is THINKING about going to one of these places: DON'T DO IT! Say you need $100. You go to one of these places and they will give you the money. You write them a check for $115 (or more, depending on the place). They will then cash the check on your pay day. Now, if you can't pay it by then, they will be happy to let you write them another check, with MORE fees. It is easy to see how a person could get into serious trouble with pay day loans. Should these companies be illegal? Not Qualified to Invest in a Hedge Fund? Then Start Your Own! David over at the SeekingAlpha blog has an interesting post about using exchange-traded funds in a way similar to how hedge funds invest, but do it in a way that is much less costly than a hedge fund. Of course, you have to know what you are doing before you start your own hedge fund. Therefore, this strategy isn't for the beginner. But, I thought it was an interesting idea. Also, I think it is interesting that David thinks exchange-traded funds are going to lead to the demise of hedge funds. I don't see that happening any time soon. The first is called FundUniverse, a blog all about mutual funds, ETFs, Variable Annuities, and Life Insurance. It is mainly a news blog, but is still a good blog to check out. The second blog to check out is StopBuyingCrap. I love the name even though it is crude. One of my favorite posts of his is titled "Woops. I Bought Some Crap." Anyway, it is a blog with a humorous name and serious content. That's all for now. As usual, once these blogs have been around a while, I'll add them to my side bar. I read a troubling article ($) in today's Wall Street Journal about how corporate mergers are causing problems with retirees' pension payments. It seems that pension administrators are finding "errors" of overpayment to retirees and then demanding the retirees pay back the overpayments. What's a retiree to do? First off, keep excellent detailed records. Keep all letters from your pension administrators. Also, keep good records of any buy outs and mergers. That way you can track who should be paying what. Put as much money as you can into your 401(k) and Roth IRA so that if you ever have a pension problem, you have other forms of income. Those are just a few pointers. I plan on addressing this issue further with a follow-up post. If you have any additional pointers, please post a comment. We finally made it home last night at about 9 pm. It was a very long drive. Later today, I hope to post part III in the "Organizing Your Finances" series. I also realized that I haven't finished the "Time Value of Money" series so I'll work on that too. Well, it's Sunday night and I thought I'd post a short update. First I'd like to thank all of you who posted comments and sent emails regarding my nephew. It was a really sad deal. My sister and her family are doing okay. We will be driving back home on Tuesday. I just wanted everyone to know that I will be out of town until Tuesday night to attend a funeral for my infant nephew. Please remember my family in your prayers. See you Tuesday or Wednesday. Hey, if you're new to the blog, please spend some time checking it out. There's over six months' worth of stuff here. Also, I have links to some of the best personal finance and investing blogs around. Feel free to look around and post comments if you want to. Finally, if you like what you see, PLEASE SPREAD THE WORD ABOUT AllThingsFinancial! This is the second part of the "Organizing Your Finances" series. The first in this series can be found here. Repeat this information for each bank account. Repeat this information for each brokerage account. It is a good idea to write the date this was completed and a note where copies were sent. I bought Freakonomics last month. Sadly, I have just now finished Chapter One. Although, I can't give the book a thumbs up or thumbs down just yet, I do have to say that I have enjoyed what I have read so far. The story in chapter one about the guy selling bagels is both interesting and enlightening. If you want to know more, you'll have to read the book. The Personal Finance Blog universe is expanding faster than I can keep up with it. I'm sure some of these blogs won't stick around. Blogging is a lot of work and a labor of love. AlphaGuy, is a blog written by a guy named Alpha, just teasin', actually his name is Jason. Here's how he describes his blog: One guy's life about graduating college, financial advice, and other ramblings. It's a good blog. Next, is FreeMoneyFinance, written anonymously. I like the blog's design and organization. It is a pretty fresh blog, meaning it hasn't been around long, but it is worth checking out. Once these blogs have been around a while, I'll add them to my sidebar. Also, for those interested, you can check out my Bloglines account for links to blogs outside the personal finance realm. If you don't have a Bloglines account, set one up. It is easy and an excellent way to keep track of the blogs (and magazines and newspapers) that you like to follow. I found this information in the appendix of an old book called the Money Club written by Marilyn Crockett, Diane Terman Felenstein and Dale Burg. The book is out of print but you might be able to get a copy through eBay or Alibris. I'm going to break this information down into several posts. Some of this information should be copied (noted with an asterisk) and the copies placed in a safe deposit box. For some reason my "What Belongs in Your Home Financial Files" post was causing my entire blog to format wrong. I took the post down. I'll fix it up and put it back up tomorrow. If you are wondering what the heck I'm talking about, you can check out my duplicate post on AllThings2. found out that AllThingsFinancial was mentioned along with several other personal finance blogs in an article written by Linda Stern on Reuters website. Thanks to the Unkown Professor for emailing me about this! If left side of some of the posts looks cut off, refresh the page. For some reason, my posts are loading weird. I have NO IDEA what the problem is. Jonathan Clements is finally writing about something ($)that I and Jack Miller, author of the Stocks or Bonds blog (see the comments to this post) have addressed: Using a mortgage to find money to invest. It is a pretty simple concept. A 30-year fixed mortgage can be found in the 6% range while the S&P 500 has averaged over 10% per year over the last 30 years. As a general rule, any time you can borrow money at 6% and get a 10% return, it's a good deal. Now, what are the risks with such a strategy? 1. Property values have been surging as of late. If you take out the biggest loan possible and the property value decreases, you will lose money if you have to sell the property. 2. Although the S&P 500 has returned 10% on average over the last 30 years, there's no guarantee that those kinds of returns will continue. Therefore, it is important to diversify. For those who are interested, here's a post I wrote last October with some analysis of 30-year and 15-year mortgages. Anyway, I think Clements might be onto something here. But, it isn't a strategy without risks. Invest at your own risk! "As Warren Buffett says, you need to be fearful when others are greedy, and greedy when others are fearful. So wehn the market's been down for a while and it looks bad, then you should be more aggressive, and when it's been up for a while, then you should be less aggressive. And, I think also, most importantly, people need to think long term. People tend to react and not anticipate. And what they react to is what they wish they'd done a year ago, or two years ago." "The underlying principles of sound investment should not alter from decade to decade, but the application of these principles must be adapted to significant changes in teh financial mechanisms and climate." "...while enthusiasm may be necessary for great accomplishments elsewhere, in Wall Street it almost invariable leads to disaster." This is interesting. Bertelsmann AG (BMG) is buying Columbia House for $400 million. Their plan is to roll Columbia House into the BMG Music Service. This just doesn't seem like a good deal for BMG. I would think that most music lovers, like myself, have memberships to both services. In other words, BMG can't count on getting all of Columbia House's members. I have been a member of the BMG club since 1994. I LOVE BMG. They have a huge selection of Jazz music. I usually only buy from them when they run a "Buy 1 Get 3 Free" sale. With taxes and shipping and handling it works out to less than $10 per CD, which is a pretty good deal. I wonder what will happen with less competition. I saw this in today's Wall Street Journal and thought I'd pass it along. Institutional Shareholder Services is making their corporate governance ratings available for free on the Yahoo Finance site. Simply click on the link which will take you to Yahoo's Finance site. Once there, enter a ticker symbol of the company you are interested in. Then, you need to click on the "Profile" link on the left hand side of the screen. The Corporate Governance Quotient (CGQ)will be listed on the company's profile page. Here's a link to Cisco's Profile Page. It says that Cisco's CGQ is better than 81.4% of the companies in the S&P 500 companies and better than 97.1% of technology hardware and equipment companies. Of course, the higher the number, the better. Here's a link to Yahoo's definition of CGR. Back when I was in college, I bought 100 shares of SilverKing Communications, which was a small broadcasting company. I had read an interesting article in the Wall Street Journal about the company and decided to give it a shot. So, I bought 100 shares at $14.78 each. My wife and I had only been married a few months when I bought it. Anyway, she started wondering out loud as to when the stock was ever going to do anything. A year went by and the stock basically sat at around $14. It started to move up from there and got into the low 20s. Then, one day I went to the local convenience store and bought the Wall Street Journal and there it was: Barry Diller to Become CEO of SilverKing Communications! The stock went up almost $15 per share that day! I held on for a while and eventually sold it at around $29 per share. BIG MISTAKE! I should have held on to it. SilverKing merged with Home Shopping Network a couple of years later and then through some acquisitions and a name change became InterActiveCorp. My little $1,500 investment would now be worth $9,144 for an average rate of return of 22.24% over the last 9 years! Oh well, coulda woulda shoulda, I suppose. 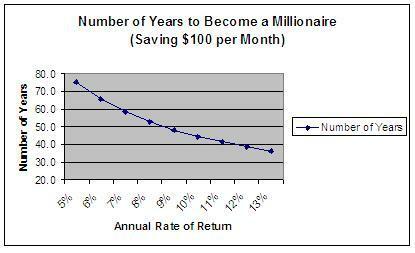 I put this chart together using Excel to illustrate how important rate of return is in reaching financial goals. The chart assumes you are investing $100 per month at different rates of return. I'm sorry for the poor quality of the chart. I don't post a lot of graphics and I'm afraid I'm not very good at it. If any of you have any tips, please comment. Self-Discipline is the ability, within yourself, based on your strength of character and willpower, to do what you should do, when you should do it, whether you feel like it or not. Character is the ability to follow through on a resolution after the enthusiasm with which the resolution was made has passed. It is not what you learn that is decisive for your future. It is whether or not you can discipline yourself to pay the price, over and over, until you finally obtain your objective. You need self-discipline in order to set your goals and to make plans for their accomplishment. You need self-discipline to continually revise and upgrade your plans with new information. You need self-discipline to use your time well and to always concentrate on the one most important task that you need to do at that moment. You need self-discipline to invest in yourself every day, to build yourself up personally and professionally, to learn what you need to learn in order to enjoy the success of which you are capable. You need self-discipline to delay gratification, to save your money, and to organize your finances so that you can achieve financial independence in the course of your working lifetime. You need self-discipline to keep your thoughts on your goals and dreams and keep them off of your doubts and fears. You need self-discipline to respond positively and constructively in the face of every difficulty. If you have never read or heard any of Brian Tracy's material, you might want to check him out. Right now, he has a special offer of a free audio program (yeah, you have to pay $4.95 shipping and handling). Anyway, it is a cheap way to acquainted with him. If you are interested, just click on the link below. This coming Thursday, my local news station is going to run a story on property taxes. It should be interesting to see what they have to say. If I remember to watch it, I'll post my comments on it after I hear the story. Property taxes are a hot topic these days. To my wife, mom, mom-in-law, sister, and sisters-in-law! 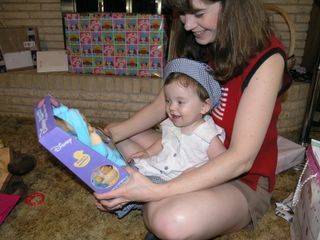 Oh, and to all my readers out there who happen to be moms! John over at FiveCentNickel emailed me about his new blog that he started this month. He only has a few entries so far, but I like what I see. Go check him out. Another blog I have been made aware of is FatPitchFinancials, written by a guy named George. His blog is mostly about investing. I found it interesting, you might too. At least my laptop "works." I'm using it right now, but with an external keyboard and mouse. The keypad on the laptop is worthless right now. I can't get it to do anything. It seems like they could design laptops to be waterproof. I guess they didn't plan on some idiot dumping coffee directly onto the keyboard. I'm so ticked off at myself right now. I have a $1,600 hunk of junk sitting my desk right now. Actually, my 11 month old daughter spilled the coffee but I'm the idiot who had it too close to my computer. I'm wondering if there is anything I can do for it? Will it dry out? If anyone is familiar with this, please leave a comment. Roger over at the RandomRoger blog brought this to my attention. Thanks Roger! In this article in the Financial Times, AllThingsFinancial is mentioned along with TheBudgetingBabe, NevBlog, and other personal finance blogs. This is my first "big" mention. Hopefully it won't be my last! Here's how it works. In the left hand column, you'll see a dollar amount. This is an annual savings amount. For this chart, I am assuming that the yearly amount invested is invested at the beginning of each year. The row across the top is the expected yearly growth rate. The numbers in the grid are the number of years it will take to reach $1,000,000 based on the yearly savings amount and the expected growth rate. The grid illustrates the importance of starting early. The earlier you can start, the better are your chances of meeting your goal. Also, starting early will allow you the benefit of being able to invest more conservatively with less risk, if you choose. So, start saving for your kids NOW! As many of regular readers know, I have two boys ages 8 and 9. Summer is just around the corner and I think it would be great for them to have some sort of summer job. They like the idea because they like money. Or, they could sell watches like Ken Leebow's son did when he was 8 years old (there is no permalink, so you'll have to scroll down to see it. Or, click on this link to the audio. I would welcome any suggestions my readers have. This story caught my eye. Apparently, unions are considering using pension money to lobby against Social Security reform. I'm sure I don't speak for everyone, but if I were a union member, I'd be a little ticked off knowing that the union officials were thinking of taking my pension money to lobby for anything. I bought an Olympus C-8080 about a year ago. I wanted a good camera that I could grow into. I have to say, I love this camera. I'm so low on the photography ladder that I can't even be considered a novice. But, this camera has a way of making taking pictures easy. I'm only having fun with my camera. I have serious doubts as to the artistic quality of what I have done, but I wanted to share them with you. You can check out what I have done on JLP's Picture Blog. It has turned out to be a fun hobby. Why Are Real Estate Prices so High? I'm thinking "out loud" so bear with me. Also, if you have something to add to this, feel free to post a comment. I was driving back from an errand and I took a drive through a housing area around where I live. There was a decent house for sale. It didn't look like anything fancy (at least from the outside). They were asking $140,000. The neighborhood was nothing to write home about. 1. Is the growth coming from low interest rates? If this is true, would the apartment rental market be hurting? If that is true then why has apartment construction been so robust lately? With all the new houses being built in my town, you wouldn't think we have a housing shortage. 2. Is the population growing? I don't know the answer to this. Perhaps the population is relocating (moving from one area of the country to another). 3. Are Boomers driving the housing market by buying 2nd homes? 4. Or, is this all being propped up by real estate tax appraisals? THIS is my theory. I think appraisals are on the rise because cities and counties desire the increasing tax base and the resulting revenue. Appraisals are raising the threshold price of homes. Builders are motivated to build more houses because they have the "insurance" of a high appraisal. I THINK I SMELL A BUBBLE!!!!! The last point is just my theory. I haven't researched this enough to know whether or not it holds water. I would be interested to know what my readers think. According to this article ($) in the Wall Street Journal, consumer advocates are suing the biggest funeral home chains, accusing them of price-fixing to keep the price of caskets high. The suit also claims that the funeral home chains charge more for services like embalming if the customer uses a casket purchased from one of the cheaper outlets like FuneralDepot.com or Costco, which sell caskets for a lot less than the typical funeral home. I have often wondered about the integrity of funeral homes. They are in a perfect position to prey on people's emotions, making them feel guilty if they don't fork out the money for the best send off of their loved one. Maybe somebody should start a "Dig 'em Yerself and Save" funeral home. I started messing around with Blogshares, which is a blog directory and also a blog trading game. It is a LOT OF FUN! If you don't have an account with Blogshares, go set one up. Then you can buy "shares" in your favorite blogs. As the blogs grow in popularity, your investment will grow. So far, here's what I "own:"
Anyway, go check out Blogshares. I got my lovely tax appraisal notice today for my house. They jacked it up another $3,200 for 2005! Our property taxes have gone up nearly $2,000 since we bought our house six years ago. When will it end? If you'll notice, they have a two-pronged method for raising taxes. First they can raise the property value (which they have done every year since we bought our house), then they can raise the tax rate. Personally, I think we are headed for a real estate bust. I think property values are not worth anywhere close to what the tax office says they are worth. I think I see a bubble in real estate values. Just my opinion, of course. Makes sense to me. However, it is a lot easier said than done. What EXACTLY is it you want? Once your goals are written down you feel a sense of commitment towards their achievement. If your goal is to get out of debt, you are going to have to be willing to pay the price. You may not be able to eat out as much or you may have to put off buying those new golf clubs. In other words, you have to be willing to pay the price. Using the goal from step three, you could write down what you owe and to whom you owe it. Then, look at your budget and decide how much you can put towards your debt. Then decide how much you are going to put towards each individual debt. You have to start somewhere. Start from where you are at. Taking action is the hardest part. Again, if your goal is to get out of debt, make a list of your debts and post it on your refrigerator. Then, each time you make a payment, cross out the old balance and put in the new lower balance. This will help you stay motivated. As soon as you start on the path to accomplishing a goal, you are going to want to give up. That's human nature. However, you have to keep at it. There you have it! That's Brian Tracy's seven-step method for achieving any goal. Now that it is nearly 2:00 AM, I'm off to bed for the second time!